Justin Marks won the 4th Annual Mid-Ohio Challenge XFINITY Series race at the Mid-Ohio Sports Car Course Saturday afternoon. It was his first victory in 25 NASCAR XFINITY Series races. It is Marks’ first victory and first top-10 finish in 2016 through 12 races this season. It is Marks’ first victory and second top-10 finish in three races at Mid-Ohio Sports Car Course. Erik Jones (sixth) was the highest finishing rookie. Elliott Sadler (700) leads the XFINITY points standings by 25 points over Daniel Suarez (675). Through 21 races this season in the XFINITY Series, Erik Jones, Daniel Suarez and Elliott Sadler have qualified for the 2016 XFINITY Series Chase following their victories. Kyle Busch, Kyle Larson, Austin Dillon, Chase Elliott, Dale Earnhardt Jr., Denny Hamlin and Joey Logano have also won an XFINITY Series race this season but are ineligible for the XFINITY Series Chase due to their full-time status in the Sprint Cup Series. 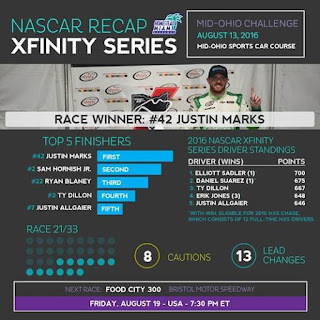 Sam Hornish Jr. and Justin Marks are also ineligible because they are not full-time drivers in the XFINITY Series.